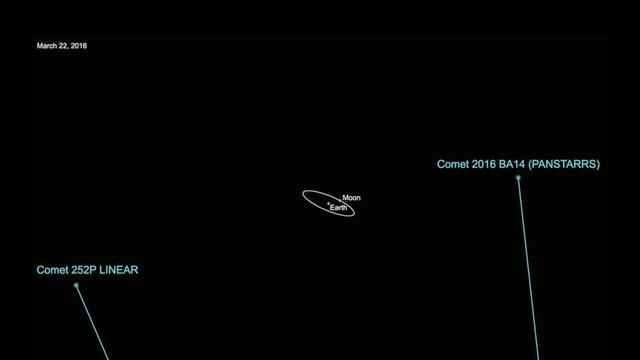 On March 21st and 22nd, two comets will by flying past Earth. Astronomers believe the duo may have more in common than timing – they could be twins of sorts. Due to their very similar flight paths, experts suggest one could have split off from the other at some point in the past. The speeding masses, named P/2016 BA14 and 252P/LINEAR, are significantly different in size, with the latter being about twice as large. Noted Paul Chodas, a scientist at NASA's Jet Propulsion Labratory, "We know comets are relatively fragile things...Perhaps during a previous pass through the inner-solar system, or during a distant flyby of Jupiter, a chunk that we now know of as BA14 might have broken off of 252P." Though the two will be passing at a relatively close distance to our planet, they are on the smaller side. Getting a glimpse of them will require powerful viewing equipment.